Items on this page may be duplicated if www.DXing.com is credited as the source. Have a news item to share? Click here to e-mail! The Uniden Bearcat SDS200 is the base/mobile version of the hugely successful SDS100. It has the same feature set as the SDS100, plus some enhancements. This is Uniden’s latest and most advanced base/mobile digital trunking scanner. Frequency coverage: 25-512, 758-824, 849-869, 895-960 and 1240-1300 MHz. The SDS200 incorporates the latest True I/Q receiver technology, which provides the best digital decode performance in the industry, even in challenging receive environments. Highlights include: True I/Q™ Receiver, TrunkTracker X, Direct Ethernet Connectivity for Streaming and Control, Complete USA/Canada Radio Database, Location Control for Simple Operation and 3.5" Customizable Color Display. The SDS200 with Trunktracker X technology supports: APCO P25 Phase I and II, Motorola, EDACS, and LTR Trunking, MotoTRBO Capacity + and Connect +**, DMR Tier III**, Hytera XPT**, Single-Channel DMR**, NXDN 4800 and 9600** and EDACS ProVoice** (* Additional or 3rd-Party software may be required. ** Paid upgrades required for DMR, NXDN, and ProVoice monitoring). Free Sentinel Software keeps the SDS200 database and memory up to date. Click here for more SDS200 information. 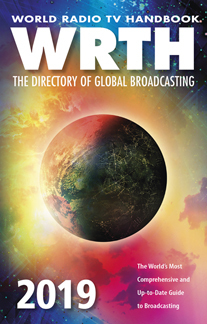 The World Radio TV Handbook has been the definitive source of broadcast radio information for over seven decades. It covers the latest on medium wave, shortwave, and FM broadcasting. It has Country-by-country lists of services and broadcasters, winter shortwave frequencies, international and domestic broadcasts by frequency and language and TV broadcasters. Authoritative receiver reviews are also featured. Special articles in the 2019 edition include: HF Curtain Arrays, Broadcasting for Peace in the Lake Chad Area, new medium wave transmitter for TWR Bonaire and V7AB Radio Marshall Island. 73rd Edition. 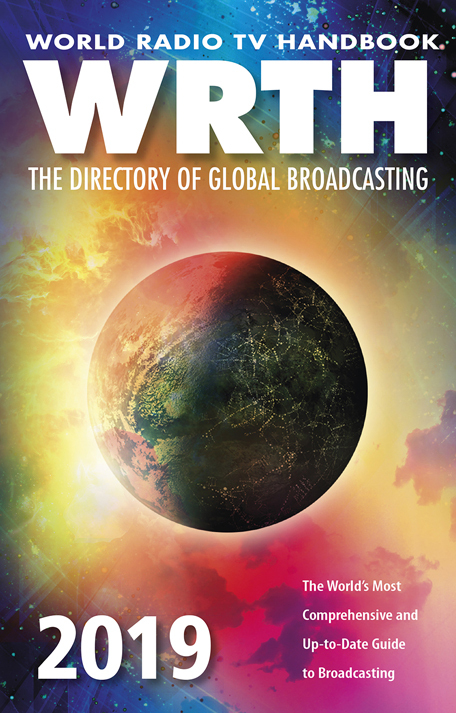 The 2019 "WRTH" is now available from Universal Radio and other select radio stores. 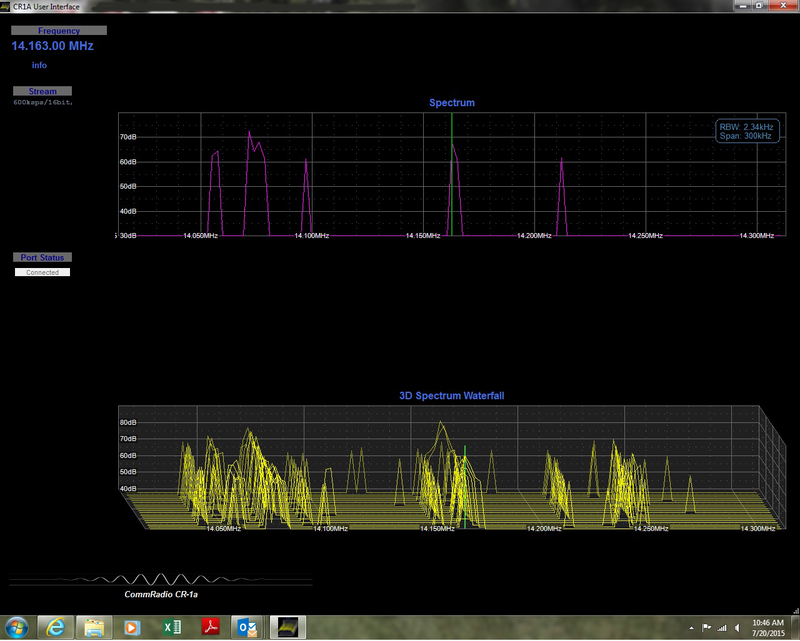 COMPACtenna in Ohio has developed a new indoor antenna for receive from 4750 to 30000 kHz. The COMPACtenna SW is a compact shortwave listening antenna designed for size restricted environment. It utilizes a patented design which includes magnetic-field-enhancement. This allows the extremely short antenna to perform amazingly well for its height. And unlike active (amplified) antennas, the passive SW is not overly susceptible to RFI interference. The SW antenna requires a 3/8"-24 mount, not included. This antenna may be used successfully with a very small ground plane. A simple 3/8x24 magnetic mount can be set on a 36 by 48 inch galvanized metal plate (available from Home Depot) or even a metal table! The result is a compact, yet effective, antenna for a variety of applications. Kenwood announced and displayed the upcoming TS-890S HF + 6 meter transceiver at Hamvention® 2018 May 2018. The transceiver received F.C.C. certification on 07/31/18. Preliminary information, photo specifications and accessories list were released. Further technical details, price and availability are expected soon. Yaesu to Distribute the AOR AR-DV10 in the U.S. In a surprise announcement at Hamvention® 2018, it was revealed that the new AOR AR-DV10 wideband receiver will be distributed in America by Yaesu USA. Coverage will be 100 kHz to 1300 MHz (less former cell freqs.) with both analog and many new digital modes supported including: APCO P-25 (Phase I & II), D-CR, DMR, Mototrbo, dPMR, NXDN, TETRA, Alinco EJ-47 GMSK, D-STAR and Yaesu FUSION. A new DALL function automatically determines the digital mode. This ground breaking became available at Universal Radio on 06/05/18. Click here for more AR-DV10 information. Icom’s long awaited IC-R30 handheld wideband receiver is now shipping. Outstanding frequency coverage between 100 kHz to 3304.999 MHz (less cellular). Reception modes include: FM, WFM, AM, USB, LSB, CW, D-STAR®, APCO P25 Phase 1, NXDN®, dPMR® and DCR (SSB, CW and digital modes: 0.1 MHz–1.3 GHz). 2000 memories (scanning at 200 channels/second), voice synthesizer, built-in Bluetooth® and GPS, spectrum display and dual receive including analog/analog and analog/digital. Dual recording is also available onto it’s microSD card. The IC-R30 comes with SMA telescopic antenna, BP-287 Li-ion battery pack, belt clip, hand strap, AC power adapter, drop-in charge tray and basic printed manual. Yes. This is the "Big One". 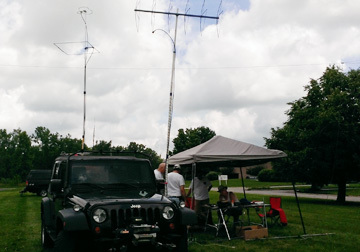 The annual Hamvention® is the largest gathering of radio hobbyists in the world. A great place to learn about the latest amateur, shortwave listening and scanner equipment. Plus a huge outdoor flea market. It is being held again in Xenia, Ohio. Universal Radio will again exhibit at booths 2005-2006. Click here for Hamvention® information. The Yaesu FT-817 series is perhaps the longest running and most successful QRP transceiver in history. The worthy successor Yaesu FT-818ND became available in March 2018. This portable marvel covers the amateur bands from 160 to 10 meters, 6 meters, 2 meters and 70 cm (440 MHz) with up to 6 Watts. All the features of the FT-817ND are carried over, and three princial improvements include: built in TCXO-9 high stability unit (great for the new digital modes), higher capacity NiMH battery and increased power output. The Winter SWL Fest is an annual conference for radio hobbyists of all stripes, from DC to daylight. The Fest is sponsored by NASWA, the North American Shortwave Association, but it covers much more than just shortwave, including medium wave (AM), scanning, satellite TV, and pirate broadcasting. The 31st Anniversary annual meeting will be held at Doubletree Guest Suites, Plymouth Meeting, Pennsylvania (near Philadelphia). Click here for Winter SWL Fest information. The highly anticipated CommRadio CTX-10 multi-mission SDR QRP transceiver will be available in late May 2018. An introductory price of $999.99 will be offered on the first 240 units produced. Universal Radio is accepting pre-orders as of 12/01/17. Highlights include: 80-10 meter transmit CW/SSB at 1, 5 or 10 watts, receive CW/SSB/AM 150 kHz-30 MHz, integrated battery, antenna tuner and CW reader. Click here for information. Universal Radio Inc. has moved to a more efficient location in nearby Worthington, Ohio to continue to serve their loyal customers. This will be the fourth location change since Universal was founded in 1942. Universal has been serving the amateur and short wave communities for 75 years. The store hours and phone numbers (614 866-4267 & 800 431-3939) have not changed. Click here for map and more info. The new AOR AR-DV10 wideband receiver made its worldwide debut at the famous Tokyo Ham Fair on September 2, 2017. Coverage will be 100 kHz to 1300 MHz (less former cell freqs.) with both analog and many new digital modes supported including: APCO P-25 (Phase I & II), D-CR, DMR, Mototrbo, dPMR, NXD, TETRA, Alinco EJ-47 GMSK, D-STAR and Yaesu FUSION. A new DALL function automatically determines the digital mode. Technical details, pricing and availability will be released soon. This device has not been approved by the F.C.C. This device may not be offered for sale or lease or be sold or leased until approval of the F.C.C. has been obtained. The new AOR ARD5700D wideband base receiver was also shown for the first time at the Tokyo Ham Fair 2017. Coverage will be 9 kHz to 3700 MHz (less former cellular frequencies in US version) with traditional analog and new digital modes including: APCO P-25 (Phase I & II), D-CR, DMR, Mototrbo, dPMR, NXD, TETRA, Alinco EJ-47 GMSK, D-STAR and Yaesu FUSION. A new DALL function automatically determines the digital mode. Technical details, pricing and availability will be released soon. Click here for more AR5700D information. Noted author Bob Grove (of Monitoring Times fame), has written a dandy new book. If your are new to the radio monitoring hobby, and want a great introduction to antenna topics, this book is for you. It covers a wide range of topics, all explained in Bob's usual clear and understandable manner. The new Icom IC-R8600 wideband receiver has been a long time in coming, but worth the wait. It offers the performance and advantages of SDR/hybird technology with the convenience and familiarity of conventional communicaitons receiver design. Click here to view larger. Click here for more IC-R8600 information. [Update 07/31/17: On live display and shipping from Universal Radio]. The new Yaesu FT-70DR Dual Band Handheld transceiver features normal FM and “Fusion” C4FM Digital voice operation at a very attractive price. The 2 meter / 70cm “one band at a time” HT provides 5 watts on both bands. The AMS (Automatic Mode Select) detects the operating mode of the received signal as C4FM digital or analog FM, and then automatically and instantly switches the receiver to the appropriate mode. The two multi colored LEDs indicate current mode of operation. Other enhancements include: wideband receive (108 - 579.995 MHz), CTCSS/DCS encode/decode, 700 mW audio output and multiple scan modes. Includes: Antenna, SBR-24LI 7.4V 1800 mAh Li-Ion Battery, SAD-18B Battery Charger, Belt Clip, USB Cable, Warranty Card and Operating Manual. Three year manufactures limited warranty. 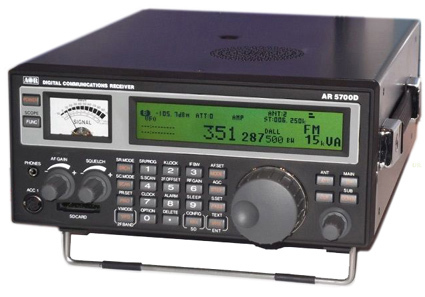 Click here for more information on the FT-70DR. In a money saving move, the Federal Communications Commission stopped issuing printed Amateur Radio licenses in 2015. There is a solution for those who would like a document the existence of their license. It's an operator certificate you can display with pride in your ham shack. 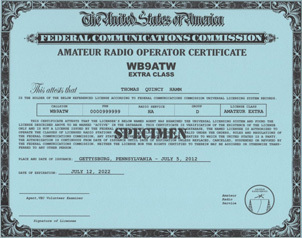 This 8.5" x 11" certificate printed on blue heavy stock vellum paper, is modeled after the legendary First Class Radiotelephone Operator License. 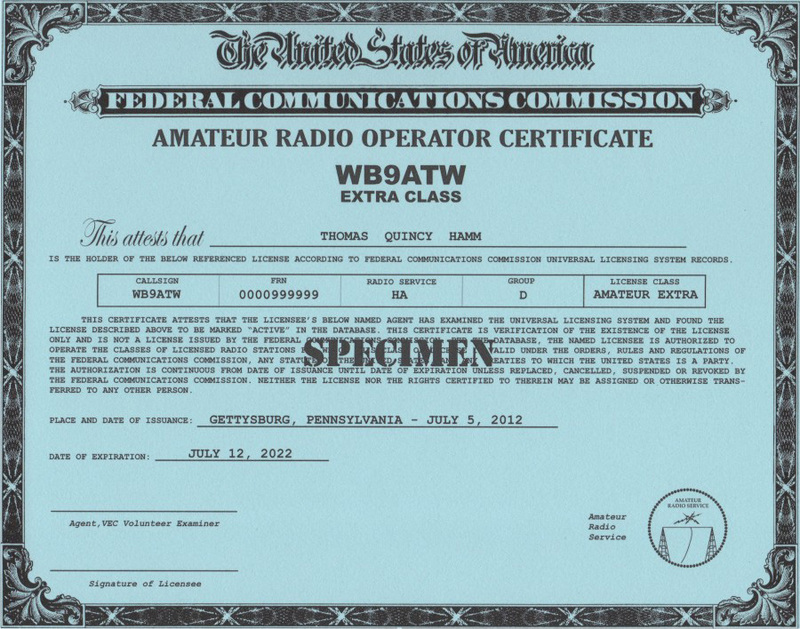 The KB9AT Amateur Radio Operator certificates are available for Technician, General, Advanced and Extra class licensees. The cost is $12.95 ppd via First Class mail. Click here for more certificate information. The Dresden (Ohio) Elementary Amateur Radio Station dramatically updated their communications equipment on March 7, 2017. The D.E.A.R.S. club is made up of elementary and middle school students. The KD8NOM callsign can often be heard on the air from this is very club. 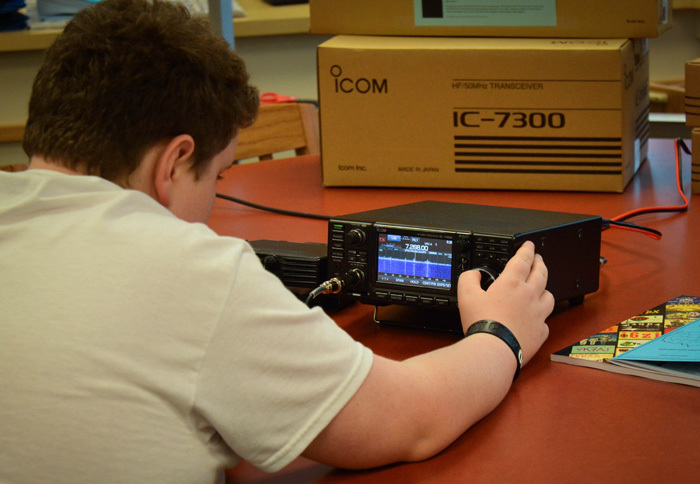 The club has enjoyed significant donations and support from local hams in Central Ohio who are eager to support young folks entering the amateur radio hobby. This effort allowed the club to purchase a new state-of-the-art Icom IC-7300 HF transceiver delivered by Eric KC8XJ, store manager of Universal Radio. 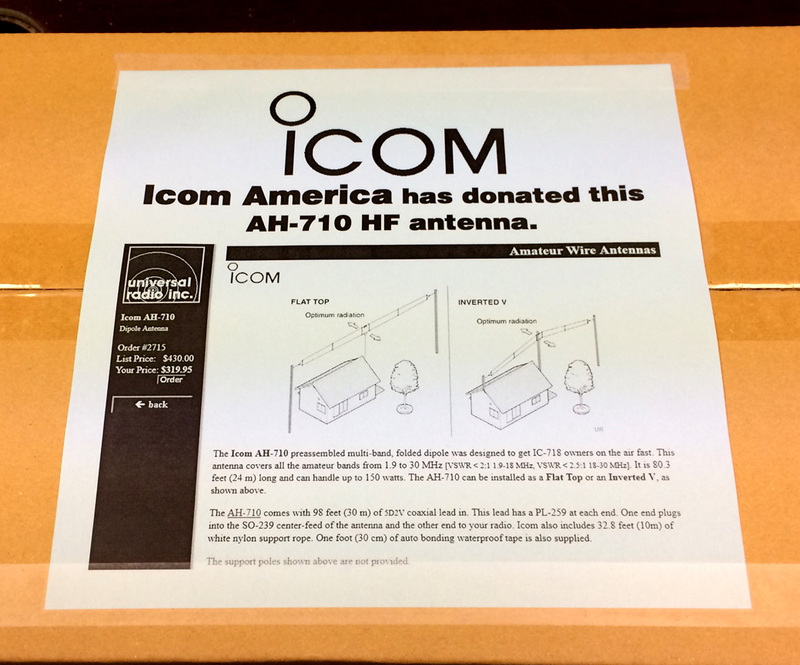 Icom America donated a new AH-710 HF antenna which will be put to good use by the students. Club coordinator, Jim Mayercak WX8J (tan coat), has done a awesome job of bringing the community, local hams and the schools together to introduce the ham radio hobby to the students. Yaesu has announced two new amateur handheld transceivers. The Yaesu FT-65R dual-band 2 meter/440 MHz has three output power levels: 5, 2.5 or 0.5 watts. Receive coverage is 65-108 (FM broadcast band), 136-174 and 400-500 MHz. The FT-65R is compact and light, yet ruggedly constructed. The speaker provides a full 1 Watt of powerful, clear audio. Features include: large white LED display, 4 programmable quick recall keys, versatile scanning, weather alert, automatic range transponder, CTCSS/DCS operation, busy channel lockout, auto power off and transmit time-out-timer. Yaesu has also announced the FT-25R mono-bander with an identical look and feature set, but it covers only the 2 meter (144-148 MHz) band. Click here for more information on the FT-65R and FT-25R. 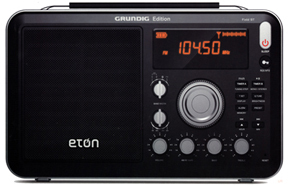 The Eton Grundig Edition Field BT is the same as respected Field, but adds Bluetooth® technology (... and as Sheldon says, "Everything is better with Bluetooth®.") The Field and Field-BT receive AM, FM, FM stereo (to earphone jack) and shortwave from 1.7 to 30 MHz. This larger than average portable produces better than average audio. Features include: digital clock/timer, RDS, separate Bass & Treble, external antenna jacks, 9/10 kHz MW step, carry strap, shortwave RF gain control knob, Lock Button, Local/DX Switch and Wide/Narrow selectivity, fast/slow tuning and 50 station memories. Click here for more Field-BT information. AeroStream Communications of Colorado impressed the hobby radio market in 2013 with its revolutionary CommRadio CR-1 and CR-1a SDR receivers. It is now poised to produce the CommRadio CTX-10 SDR transceiver. This multi-mission QRP rig will cover the amateur bands from 80 to 10 meters CW/SSB with power output adjustable from 1 to 10 watts. The general coverage receiver section uses multiple preselectors for optimized reception from 200 kHz to 30 MHz. An integrated CW reader and antenna tuner enhances portability. The new design uses ruggedized land mobile power amps in push-pull. Every aspect of the radio design is optimized for low power consumption and the all metal construction makes it suitable for field use. This radio is expected to be available early 2018. 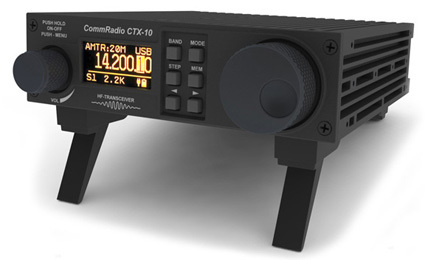 Click here for CommRadio CTX-10 information. This device was F.C.C. approved in October 2017. The information shown is preliminary and is subject to change without notice or obligation. The new Icom IC-7300 HF plus 6 meter 100 watt transceiver has been a great success. Icom has just announced the SP-38 speaker which promises to be a great compliment to this radio. Click here for IC-7300 or SP-38 information. The IC-7300 is on live display at Universal Radio. Tokyo Ham Fair August 19, 2016. A number of major new radio models were announced at the JARL Tokyo Ham Fair on August 19. The Icom ID-51A PLUS 2 D-Star handheld transceive adds two new D-Star modes. Icom debuted two new wideband receivers. The new Icom IC-R8600 desktop receiver is in the same form-factor as the IC-7300 HF transceiver and will also be SDR based. Coverage is 0.01 to 3000 MHz. The new Icom IC-R30 handheld receiver will feature similar frequency coverage (TBA). Both will be capable of “Phase 1” P25 digital plus additional digital modes. Icom also announced the new IC-7610 HF Transceiver. Dual receive and a larger touch screen display were noted and is in the same size cabinet as the current IC-7600. More details are TBA. Also a new matching external speaker called the SP-39AD was shown with the IC-R8600. (The above items had not been FCC approved as of 09/01/16). Yaesu officially announced the improved FT-991A HF/VHF/UHF transceiver. A color waterfall and a real time spectrum scope have been added and it features a 3 year limited warranty. Availability is scheduled for late September 2016. Kenwood officially announced the new and very exciting TH-D74A Tri-Band HT with GPS/APRS, color TFT display and D-Star. 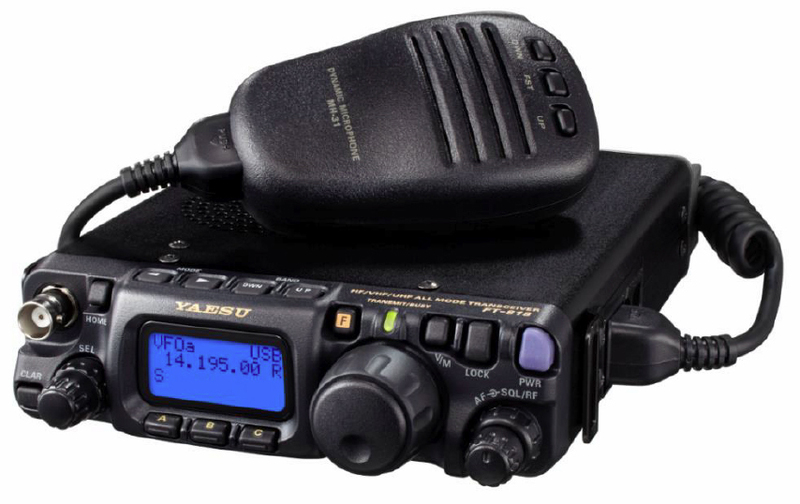 Yaesu has announced two new 2 meter amateur mobile transceivers. The first announced was the FTM-3200DR. 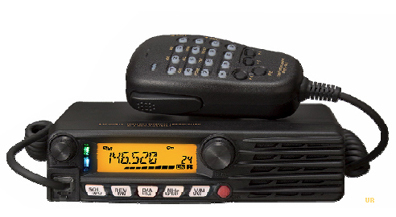 It is consistent with Yaesu's reputation of robust construction and big sound. The front firing speaker delivers 3 Watts of clear audio. The RF output power may be set for 65, 30 or 5 Watts. It operates in traditional FM mode plus the System Fusion C4FM digital mode with Automatic Mode Select (AMS) to recognize whether a transmission is digital or analog, and automatically sets the mode. Other features include: CTCSS/DCS encode/decode with split Tone and DCS encode-only capability, RF Squelch, Transmit Time-Out-Timer, Automatic Power-Off, Automatic Repeater Shift, Busy Channel Lock-Out, Separate Transmit Frequency Memories and a multi-colored status LED. 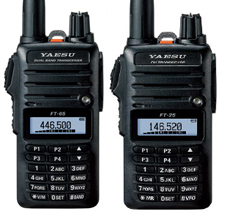 Yaesu has also announced the FTM-3100R which is identical, but without the System Fusion C4FM digital mode. Click here for more information on the FTM-3100R and FTM-3200DR. 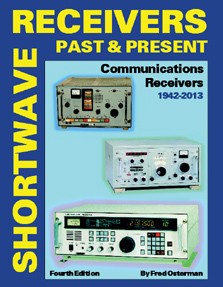 The Second printing of the Fourth Edition of Shortwave Receivers Past & Present is now shipping as of 01/18/16. This 800 page is is a comprehensive guide to over 1700 shortwave, amateur and commercial communications receivers (plus 1200 variants) manufactured produced in the last 70 years. This hardbound book features over 1800 photos and is available for shipping worldwide. 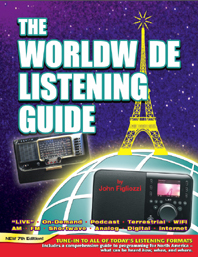 The Worldwide Listening Guide book explains radio listening in all of today's formats: “live,” on-demand, podcast, terrestrial, satellite, Internet, digital, analog, AM, FM, shortwave and WiFi. Here is a comprehensive guide to what can be heard how, where and when. Wire-bound to open in a flat, easy-to-use format. New expanded Seventh Edition. Printed December 2015 W5YI 160 pages. Priced at under $25, this book is a must for world band enthusiasts. Click here for more information. GRE was the first to offer Zip Code programming of scanners allowing to scanner listeners to avoid the often difficult step of programming their receiver. By merely entering your postal Zip Code the radio would self program area frequencies. GRE was acquired by Whistler who continued these models. Now Whistler is offering an updated version of the popular WS1095, called the WS1098. It continues to offer easy Zip Code programming, but also adds a conventional keypad for easy entry of additional frequencies. Click here for more WS1098 or WS1088 information. recording by scannable object saved to Windows audio file, clock/calendar function adds date/time to recordings, dedicated SKYWARN® button, programmable audio/visual alert on Spectrum Sweeper. Whistler initially plans to offer both the earlier and enhanced "keyboard" versions. The new Icom IC-7300 HF plus 6 meter 100 watt transceiver was unveiled at the Tokyo Ham Fair August 22, 2015. The attractive and capable new radio sports a new level of technology for its class including a TFT color touch screen with real-time waterfall spectrum scope. Click here to view larger. Click here for more IC-7300 information. [Update 03/31/16: On live display and shipping from Universal Radio]. 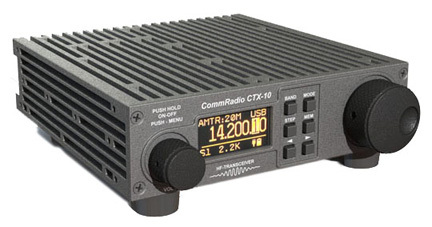 The popular and versatile, CommRadio CR1a communications receiver has a new capability. The manufacturer is now offering a free Windows based program to provide a spectrum display with full waterfall capability. This free download even works on Windows notebooks providing great power and portability. Click here for more CR1-a information. The Apex Radio HPF2050 high-pass filter is designed for shortwave listeners who may be encountering reception problems from nearby AM stations. The filter blocks offensive signals below 2 MHz. It enables the receiver's circuitry to better cope with strong interfering signals that can leak into the shortwave band. 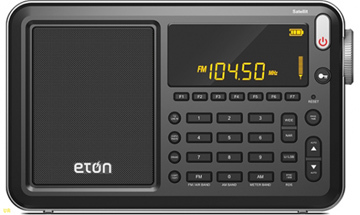 The Grundig Satellit This latest version provides full reception of longwave, medium wave [AM band], shortwave and FM broadcast. It also covers the civil VHF aeronautical band and functions as a clock radio. Features include 700 alphanumeric memories, 9 or 10 kHz medium wave step, Local/DX switch and built in built-in clock. Shortwave reception is enhanced with Synchronous Tuning circuit that improves sound quality by reducing distortion and fading. Click here for more Satellit information. The highly anticipated County Comm GP5/SSB has been released. This interesting and unusual portable radio covers AM, FM and shortwave 1.7 - 30 MHz. Long wave coverage from 150-520 kHz is also available when the MW step rate is set to 9 kHz. Unlike most other portables in its price range, it provides quality reception of SSB - Single Sideband. It boasts a number of other enhancements including: Easy Tuning Mode, 550 Memories (100 AM, 100 FM, 250 SW and 100 SSB), Scanning, Digital Clock Alarm, Removable MW Ferrite Antenna and DSP Technology. Operation is from three AA cells (not included). The radio includes: MW bar antenna, carry pouch, stereo ear buds, wire antenna and manual. Click here for more GP5/SSB information. 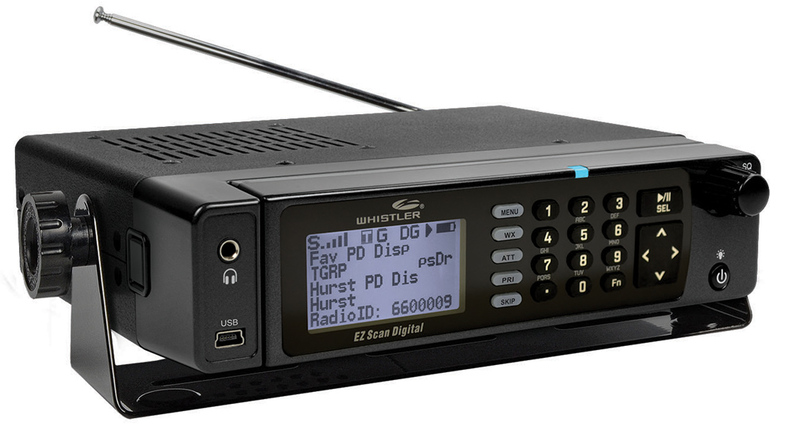 Yaesu FT-2DR FM/Digital HT Announced. Yaesu has announced the new exciting FT-2DR 2 meter/440 HT that supports traditional FM and C4FM FDMA digital modes. I sports a 1.7-inch high resolution touch screen. The AMS (Automatic Mode Select) capability instantly recognizes either digital or FM analog communications for co-existence between various modes. Standard System Fusion features include: Snapshot with image data transmitting (requires optional MH-85A11U), Smart Navigation, Digital Group Monitor (GM) featuring position data and ID data transmitting during transmissions and full support for the new WiRES-X System. Other enhancements include: complete shortwave receive coverage, 700 mW clear loud audio, built-in High Sensitivity 66 ch GPS with antenna, 1200 bps/9600 bps APRS® function, Dual watch (V/V, U/U/, V/U), Dual Monitor (C4FM Digital/C4FM Digital), HF receive coverage (AM Mode), GPS Logging/Recording capabilities, Water resistant (IPX5 Rating), and microSD Card Slot. This new model started shipping April 2015. Universal Radio hosted a Field Day demonstration on the lawn area in front of the store on Saturday June 28th, 2014. Operators of the Universal Radio Club Station W8BTW were: Eric (KC8VWL), Will (W8WB), Larry (K8BBQ), John (W8JTC), Sean (KB8JNE) and Toni (KC8ASF). HF Stations covered 160-10 meters and VHF stations to 1.2 GHz. PSK31 and digital modes were in use as well as CW, SSB and AM. Solar power operated all four stations. Thanks to everyone who stopped by. Click here to view photo-video recap. The recently released, American made, CommRadio CR1a communications receiver is a true SDR (software defined radio), but does not require a computer. Enjoy the benefits and performance of state-of-the-art SDR, but in a conventional radio package. The CR-1a SDR is independent of a host PC, using embedded digital signal processing technology that provides a degree of portability and performance previously unavailable to the radio enthusiast. Coverage includes: 500 kHz-30 MHz, 64-260 MHz and 437-512 MHz in AM, SSB, CW, WBFM, NBFM modes. 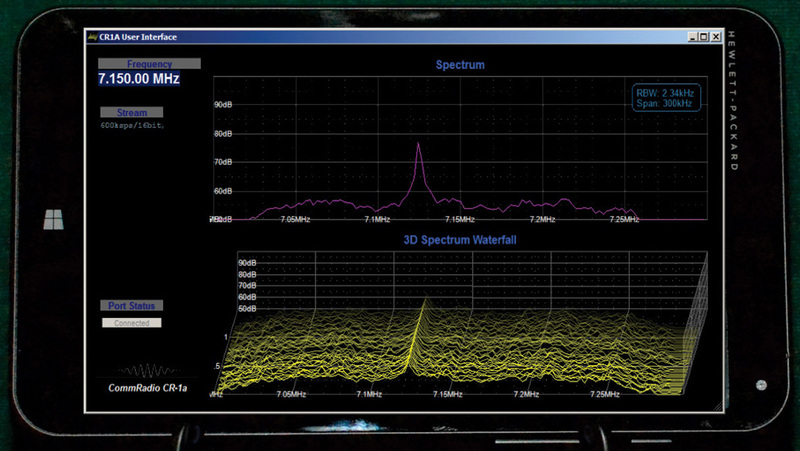 Memory and spectrum scanning are available on HF. The incredible performance is combined with exceptional portability and ease of use. The CR-1a comes on the success of the earlier CR-1, adding I/Q output on the SSB port, a new amber display, and easier web upgrading. The radio may be powered via USB or 6-18 VDC input. In both cases the optional Li-ion battery will be recharging, even when the radio is in use. All this top-shelf American technology and capability is housed in a solid, but very compact, metal case measuring 5.64 W x 2.43 H x 6.10 D inches. Click here for more CR1-a information. 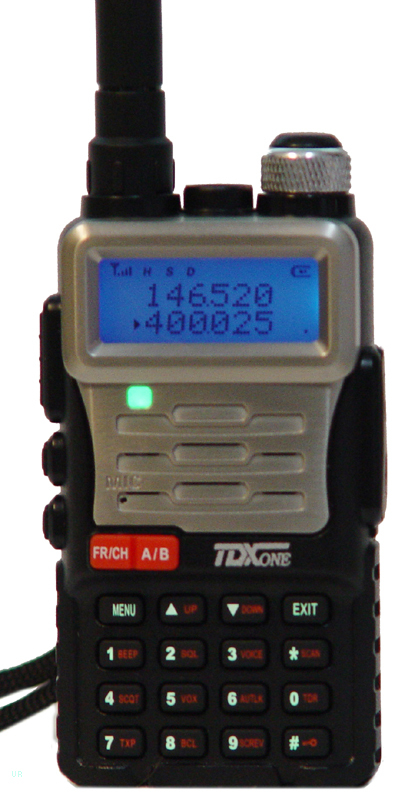 The new TDXONE TD-Q8 HT has received F.C.C. approval is now available for sale. It has 4 watts RF power for 144-148 and 430-450 MHz transmit. It receives from 136-174 MHz, 400-520 MHz and the FM broadcast band (88-108 MHz). It features 256 memories. The TD-Q8 comes with: Li-ion battery, charge tray, AC charger, standard SMA antenna, manual and belt clip. Visit www.tdxone.com for more information. 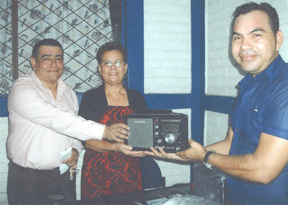 Two Grundig model S350DL shortwave radios were presented for classroom use to the Dolores Souza school located in San Miguel, El Salvadore. The donated radios were donated each by Ears To Our World and Universal Radio. The presentation was by Danys Guzman Colindres, Brother of Flower Lorenzo. Danys is shown on the right and the school Director is on the left. Next to him is the sub-Director of the school. Arrangements for the donation was courtesy of Don Schimmel. The recently unveiled AOR AR5001DB wideband communications receiver covers 40 kHz to 3150 MHz (less cellular) in: USB, LSB, CW, Wide FM, Narrow FM, AM and AM Synchronous modes. APCO P-25 mode is available optionally. We got to test drive this radio on June 1, 2010 in the Universal Radio showroom. This radio has some extraordinary features, and most impressive specs. Click here for more information. 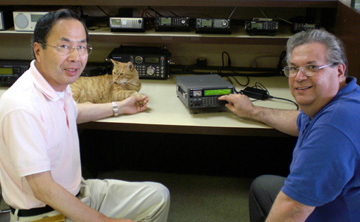 Shown in photo: Mr. Takashi Nakayama KW6I, Executive Vice President, AOR USA Inc., Boomer and Ron Rateno W9WL [SK], former Operations Manager, Universal Radio Inc. The government "U" version of this radio and the consumer "B" version are now available. 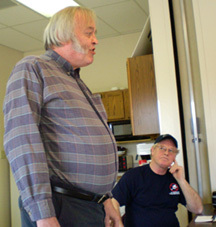 Noted radio author, George Zeller (shown in foreground) presented a seminar on Pirate Radio at Universal Radio on Saturday April 11, 2009. Mr. Zeller writes a pirate and clandestine shortwave radio column for Monitoring Times magazine. He is also a contributor to Passport to World Band Radio. This presentation covered pirate radio past and present and was part of the monthly NASWA Central Ohio Chapter meeting. NASWA - The North American Shortwave Association, is the premiere organization in North America for shortwave listeners and DXers. 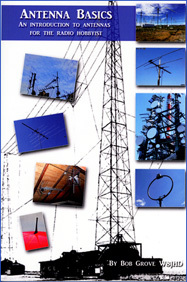 Since 1961, NASWA has focused on domestic and international broadcasts on shortwave frequencies between 2 and 30 MHz. NASWA members receive The Journal, a printed monthly digest of the latest logs and news about shortwave radio, as well as various feature articles and columns. Members can also subscribe to a weekly e-mail DX tip sheet, Flashsheet for no additional charge. You will be put on the email list for meeting information, updates and reminders. Ears to Our World is a new humanitarian organization focusing on the distribution of shortwave radios in the developing world. The mission is specifically designed to enable children in the most remote, impoverished parts of the world to educational programming, local and international news, emergency information and music through the use of shortwave receivers. 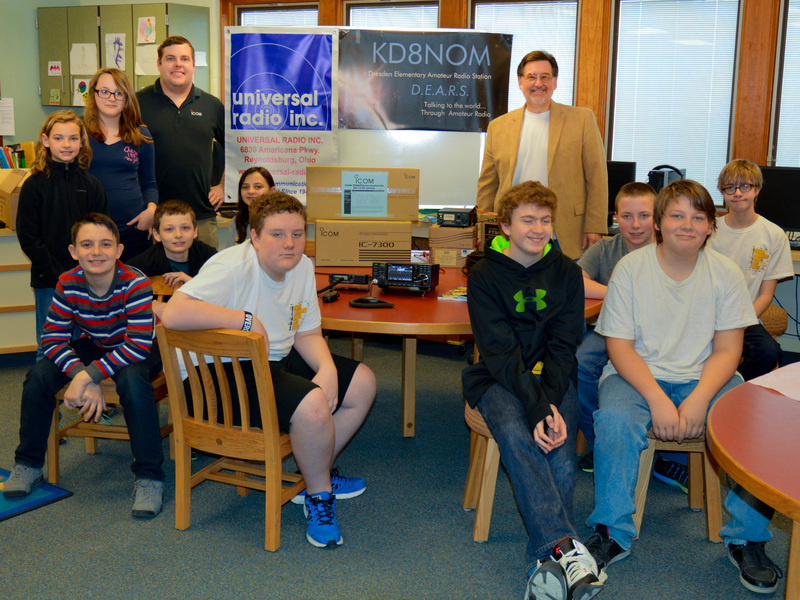 The initial focus will be on getting radios into the classroom. Universal Radio donated the initial trial group of Grundig FR200 radios for Africa. 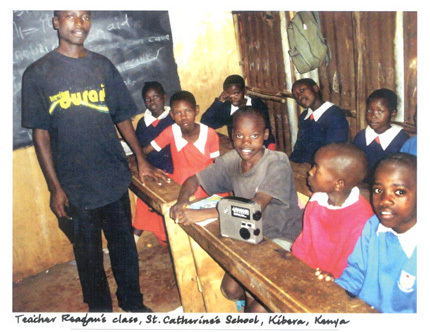 Serah Mucha, Ears to Our World partner with World Corps Kenya, delivered the first Grundig shortwave radio to Saint Catherine's School in Kibera, Kenya. Recently, Etón CEO and Chairman, Dr. Esmail Amid-Hozour, offered his enthusiastic support of this program with a generous commitment of hundreds of Grundig FR200 radios! Looking for information on a new, discontinued or future amateur radio models? Then check out the Quick Radio Index at the Universal Radio website. This feature will bring you only one click away from photos, specs and info on hundreds of amateur radio receivers and transceivers. If you like old (and new!) radios check out QRI. Most radio hobbyists are familiar with the shortwave spectrum above the AM broadcast band, but many are not familiar with the fascinating longwave spectrum below the AM broadcast band. Listening to Longwave by Kevin Carey is a nontechnical introduction to the fascinating "basement band" of the radio spectrum. This up-to-date book reveals the interesting world below 500 kilohertz. Topics includes: who is on the air, LW reception equipment, listening tips, sounds of nature: Whistlers, Squeaks, Dawn Chorus and other radio atmospherics, navigation beacons, time stations, broadcasters, NAVTEX and the Lowfer license-free band. This book is now available for $6.95 plus shipping from Universal Radio. 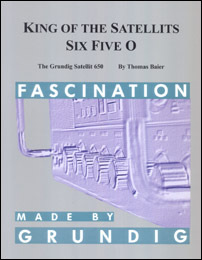 German author, Thomas Baire's respected treatment of the venerable Grundig Satellit 650 is now back in print. This new second printing is perfect bound with color covers. Over 100 pictures are featured in this 80 page book. Learn about variants, production numbers, disassembly, adjustments, bulb replacement and much more. The Owner's Manual and circuit schematic are also fully reproduced. This is a must have reference for anyone lucky enough to own a Satellit 650. It is now available from Universal Radio. Universal Radio has added photographs of select used items to its website. Additionally, recently sold used items are now archived. This feature will of interest to radio collectors and dealers of used amateur and shortwave equipment.